Matrix plan allows you to build a very limited width organization. 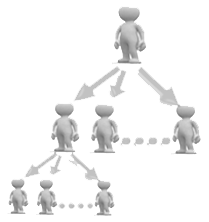 In this plan a distributor is restricted to a certain number of people at each level. A matrix plan is easy to manage, simple and straight forward. In first level the distributor’s width ranges from 2 to 5 people. As more number of people register they go under those first level people. For example, if there were 3 first level people there could be 9 people on the 2nd level and 27 people on the 3rd level. Thus an organization can grow in to hundreds or even thousands of people. A matrix plan is easy to manage because your frontline members will not be more than 2 or 3 people; it is much easier to invest yourself into your front line members. This type of network marketing plan is generally the easiest to explain to a forthcoming down line member. Compared to other plans in network marketing compensation plan, matrix plan can be very profitable if you know the basics of building an MLM business. In MLM Matrix Plan, the enrolments are done by the computer to fill the matrix slots. The computer searches for the empty slots and gives the new joining over there. The company develops Matrix Software, which is easier to work upon, and proficient. The computation for Matrix MLM Software development by the company is enormous. Spillover is offered by the many matrix plans, where new members are added into your matrix from the previous one. Matrix plan can be made more prosperous by the cooperative effort of the people working upon the Matrix Plan development.